Before Black Lives Matter and Hamilton, there were abolitionist poets, who put pen to paper during an era when speaking out against slavery could mean risking your life. Indeed, William Lloyd Garrison was dragged through the streets by a Boston mob before a planned lecture, and publisher Elijah P. Lovejoy was fatally shot while defending his press from rioters. Since poetry formed a part of the cultural, political, and emotional lives of readers, it held remarkable persuasive power. Yet antislavery poems have been less studied than the activist editorials and novels of the time. In Lyrical Liberators, Monica Pelaez draws on unprecedented archival research to recover these poems from the periodicals-Garrison's Liberator, Frederick Douglass's North Star, and six others-in which they originally appeared. The poems are arranged by theme over thirteen chapters, a number that represents the amendment that finally abolished slavery in 1865. The book collects and annotates works by critically acclaimed writers, commercially successful scribes, and minority voices including those of African Americans and women. There is no other book like this. 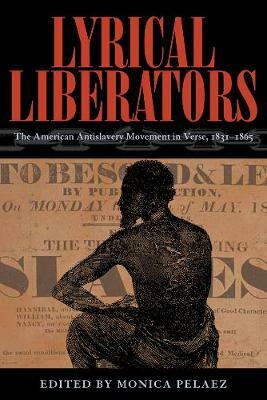 Sweeping in scope and passionate in its execution, Lyrical Liberators is indispensable for scholars and teachers of American literature and history, and stands as a testimony to the power of a free press in the face of injustice. "A stirring anthology...This collection's merit-the stunning and still-raw power of voices once lost or neglected speaking on the topics of fugitives, death, motherhood, equality, freedom, and war-and its usefulness in a broad range of disciplines make it indispensable. Summing up: Essential."